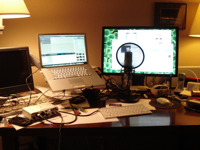 Recently a friend and I started talking about possibly doing some technology podcasts. Our general concept is to have a podcast that talks about how developers keep current with the never ending sea of new technologies, languages and developer kits (SDKs). It is both daunting and exciting to always be learning new technologies. The structure of a weekly or bi-weekly podcast that dives into a new technology or concept each time will give us a means for exploring new things that interest us, and might also be useful to other developers. Well, if we are going to do a podcast we need gear. I didn’t have anything at all, but my friend already had a good microphone and preamp from other audio work he does. I spent a few weeks educating myself about the various alternatives and finally settled on the following setup to get started. Sennheiser HD280 Professional headphones for monitoring the audio. Edirol UA-25 USB audio capture and MIDI interface. Rode NT1-A Studio/Live Performance Condenser Microphone. Atlas Sound DS7E desktop mic stand. Shure Studio Mic Pop Filter. ProCo StageMASTER 10′ mic/audio cable, XLR. I ordered everything from the folks at BSW since they sponsored the Gear Media Tech podcast which was very helpful as I figured out what to purchase. Here are a couple pictures of the initial setup. As you can see in the first picture, the Rode NT1-A fits nicely in the Atlas desktop mic stand. The Shure pop filter attached to the mic stand at the base and was easily positioned in front of the mic. The only issue I have noticed with this setup so far is that unless the pop filter bracket is swung to the side it causes the whole stand to tip forward a bit due to the weight of the mic and pop filter. With a little adjusting I found a position for the pop filter that seemed to keep the weight distribution in check. I had considered a more professional desktop swing-arm mic stand, but figured that I would only be recording about once a week. I didn’t really like the idea of having that swing-arm attached to my desk all the time. It just seemed like that would become a distraction. The desktop mic stand is very portable and I think that will make it easy to move it out of the way when not in use. My friend went the other route, getting a desktop swing-arm, in part because he has a limited amount of desktop space. It only took about 15 minutes from the time I opened the BSW box of goodies until I had the whole setup running with me MacBook Pro. The Edirol UA-25 was recognized by the MacBook Pro right away. Here is a picture of the whole setup. The desk is kind of messy right now. I will be experimenting over the next few days with how to better organize all of the pieces. My MacBook Pro is held up off the desk by a Ergotron laptop swing-arm, and is also hooked to a 24″ Samsung SyncMaster 245BW monitor. One issue I have right now with the arrangement of the equipment is that the mic gets in the way of the lower half of the 245BW. 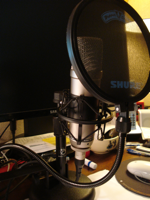 Since I expect to be recording some podcast screen casts using ScreenFlow I really want to workout a placement for the equipment that doesn’t get in the way of using the screen, but still keeps the microphone positioned for good sound pickup. Once I figure out a setup that works for me I will post an update here.